The highlight of February was the personal finance blogger meet sponsored by ICICI Prudential AMC (the Mutual Fund Part of ICICI Pru) in Mumbai on February 16, 2013. The meet was called by ICICI Pru to connect with bloggers to know more about the retail investors and issues that still keeps investors away from Mutual Funds. It was a nice discussion and was attended by 11 bloggers and senior management of ICICI Prudential. I plan to write a detailed post on the same. In the meantime here is the earning and traffic report of my blog for February 2013. Around 32.6 thousand people visited Apnaplan.com in February 2013 leading to around 55 thousand page views. Below is the chart from Google Analytics showing monthly breakup of visitors and page views. I had set up target of 1 Million page views for 2013. To reach that I need average monthly page view of around 85,000. I was short of this target this month too. 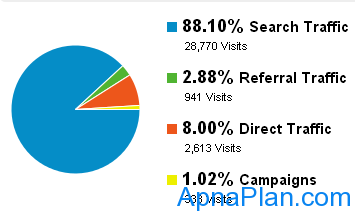 Apnaplan.com got about 88% of traffic from search engines. This is same as it was for earlier months and is good news. Below is the breakup of traffic sources. I had written 24 posts on ApnaPlan.com in February 2013, which is less than last month. I am still satisfied by this and hope to continue with the same pace. I have also uploaded the Income Tax Calculator for FY 2013-14 in Excel. You can download the same to calculate you taxes for next year and plan accordingly. The Alexa traffic Rank as of today is 122,741, while the website is ranked 12,252 in India. This is good for 21 month old blog. Slowly and steadily the blog is moving toward the top 1 Lakh mark. As of today there are 1,190 subscribers using feedburner. We added 69 subscribers this month. This was way below my expectations. The Facebook page of Apnaplan.com has 123 Likes. This month 15 new readers liked us. Its encouraging but I am surely looking for more :). So if you like us – do like us on Facebook too! I have also started my twitter account this month. So you can follow me on twitter. As of today I have only Infolinks on the site. As I said earlier, this is not a great revenue generator and has generated USD 48 in Feb 2013.